Some people should think twice before opening their mouths. Actually, we all should. That was certainly the case for one 20-something year old who recently royally failed to do so - and subsequently learned an important lesson. 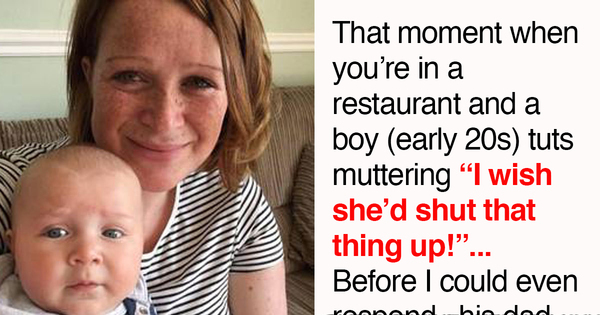 Young mother Lucy was out for breakfast with her eight-month-old baby boy. As commonly happens with babies, her son began to cry. That's when she heard the 20-year-old mutter: "I wish she'd shut that thing up!" The guy's father, however, was in close proximity, and heard what his son said. That's when he stepped in and taught his boy an important lesson. 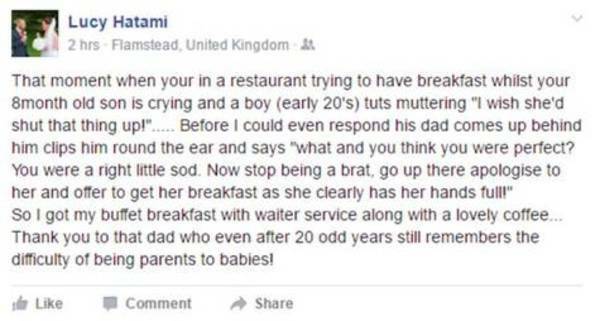 Lucy Hatami from Flamstead, UK, was out for breakfast recently when a 20-year-old seemed rather bothered by her son. 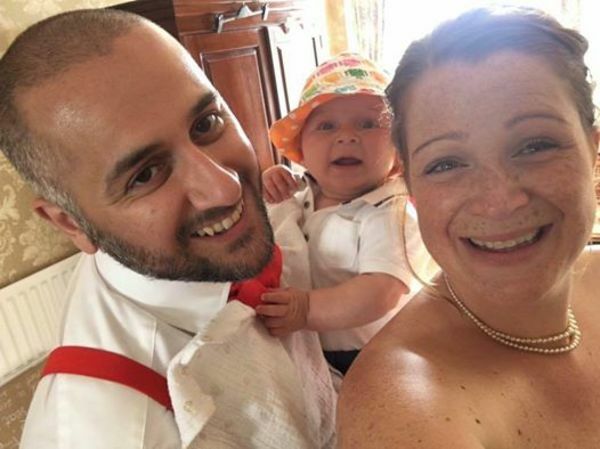 The 8-month-old baby began to cry loudly, according to Mummys Page. A young stranger nearby then muttered something about the mom getting her son "to shut up". But what then happened allowed Lucy to regain faith in humanity and parenthood.The 20-year-old boy's father then came over directly to his son, Lucy explains on Facebook. "What and you think you were perfect? You were a right little sod," the dad said. The father then asked his son to apologize and help Lucy get her breakfast from the buffet, as her hands were clearly full. "So I got my buffet breakfast with waiter service along with a lovely coffee... Thank you to that dad who even after 20 odd years still remembers the difficulty of being parents to babies," Lucy concludes in her post. Brilliant! I think this story goes to show that children are never too old to be reprimanded by their mothers or fathers - when needed.